We eat pork all the time…. It’s awesome on the grill, in the oven, in an egg roll or on the stove top. 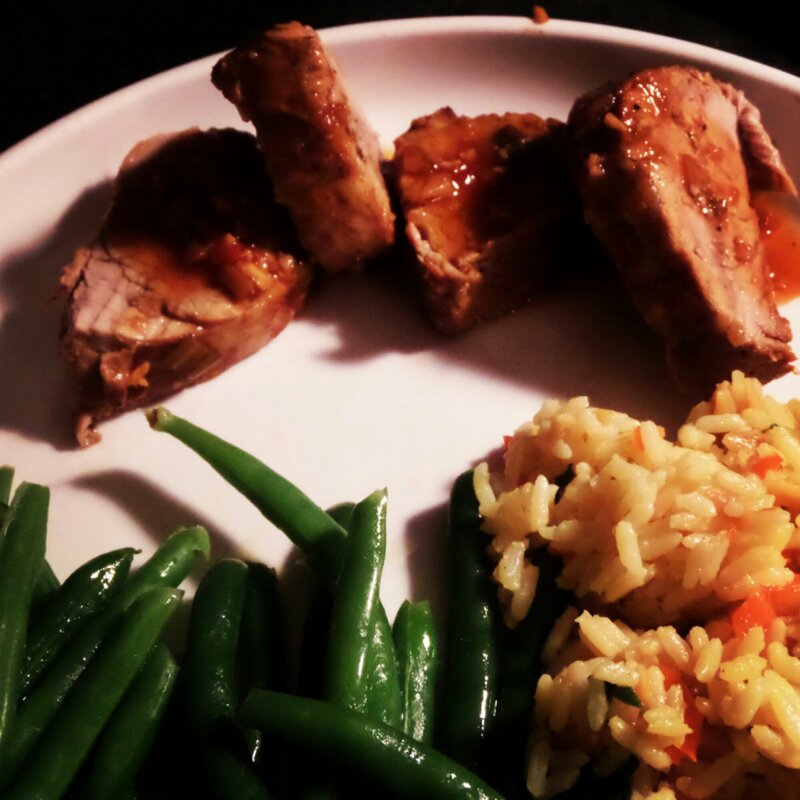 Pork tenderloin is my cut of choice but it has its challenges. It’s a very lean cut so it can dry out quickly. I remember the first time I attempted to cook it for Stevo. It was a disaster. The pork was so incredibly tough….. Like chewing on a shoe, kind of tough. I’ve since learned a few crucial things necessary to make a seriously yummy tenderloin. 1.) Remove the silver – start at one end and use a sharp knife. Grab the silver skin and slide the knife under it, running it down the length of the tenderloin. 2.) 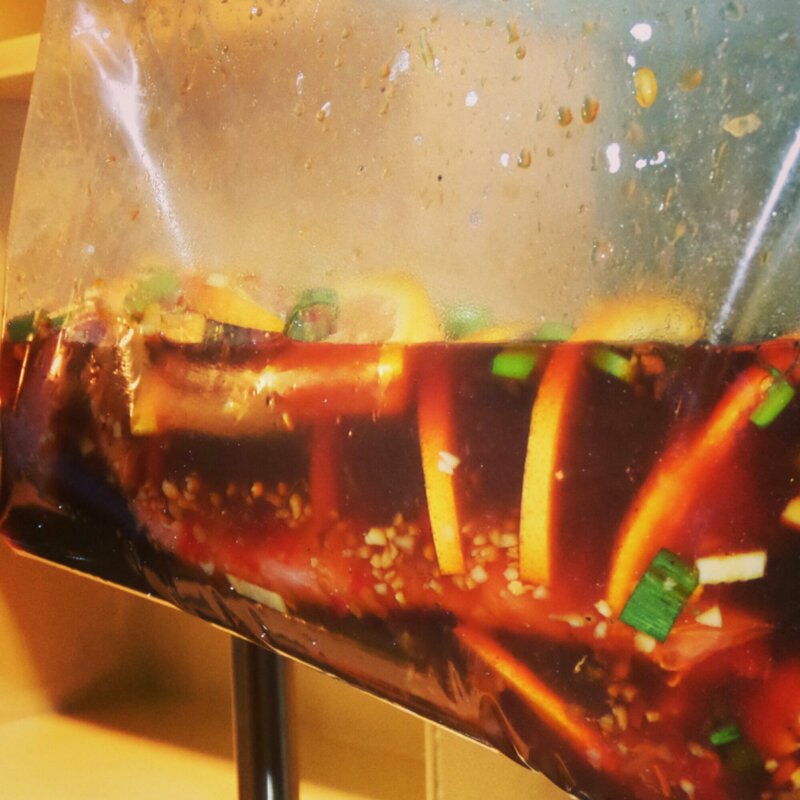 BRINE – let the tenderloin soak in a water solution with 1 part salt and 1 part sugar. For a 1.5lb tenderloin, I use 6 cups of water, a quarter cup of salt and a quarter cup of sugar. Let it soak for 20 minutes to an hour. 3.) The pork should be removed from the oven when it reaches 158°. Letting it rest, in an aluminum tent, will bring it up to 165°. 4.) Pork can be pink!! Do not overcook it!! 5.) 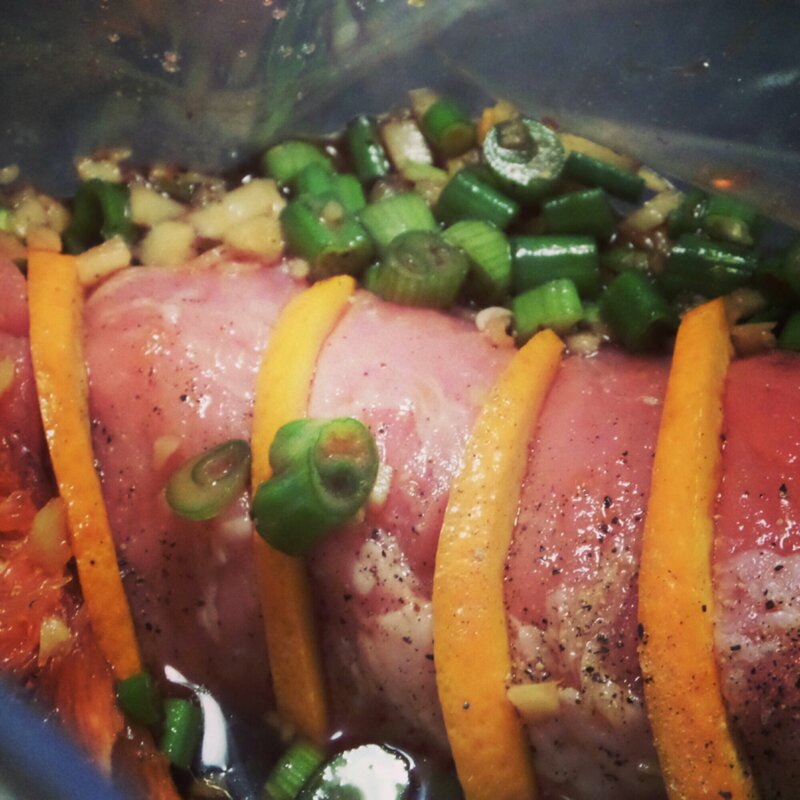 Pork, on its own, is B O R I N G. However, it takes on the flavor of any marinade really well…. Sometimes (more on that later). This recipe by Anne Burrell (link to follow) is full of flavor. 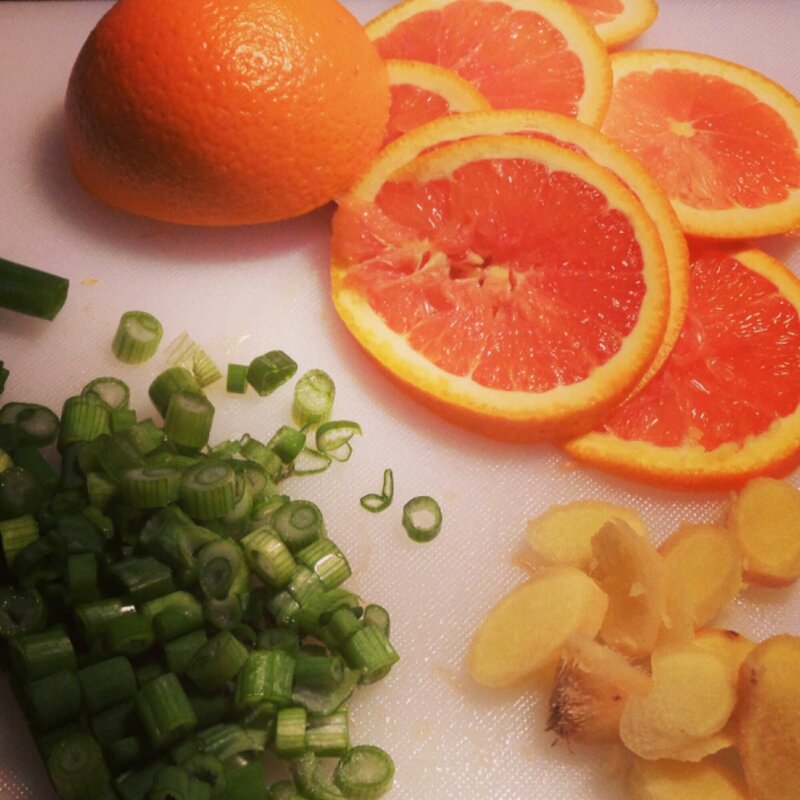 It’s all about the orange zest, soy sauce, ginger, green onion, and garlic marinade. Her recipe gives grilling instructions but on a snowy night like tonight, I cooked it in the oven, at 350 for 25 minutes, after searing it on the stove. After you’ve brined the pork, add all the ingredients to a large zip lock bag. 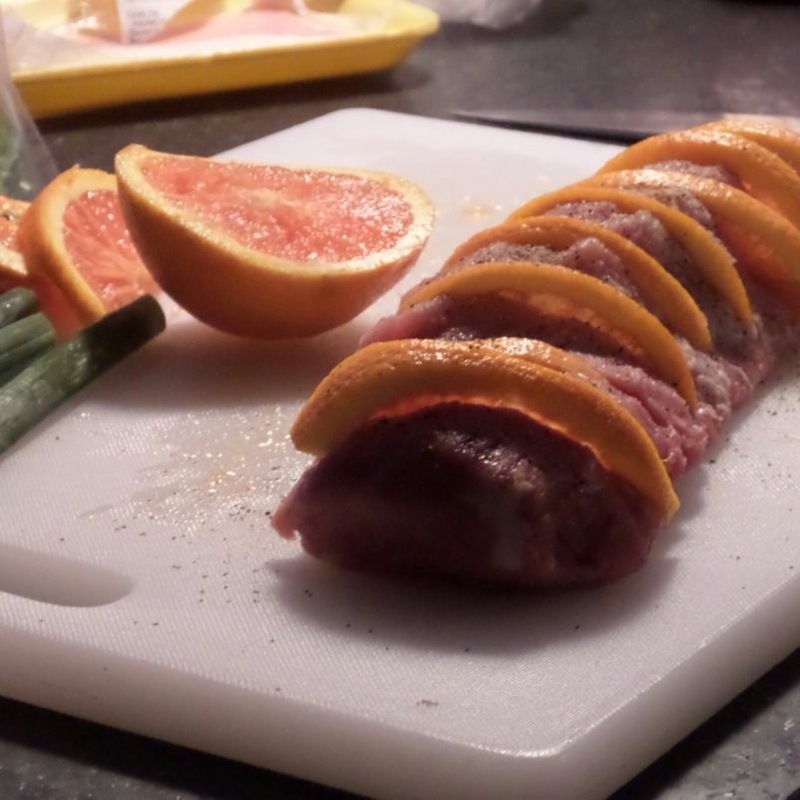 I like to cut small slits in the tenderloin and fill it with apples or in this case, blood orange slices. I then let it hang, literally hang, from my cabinet door. 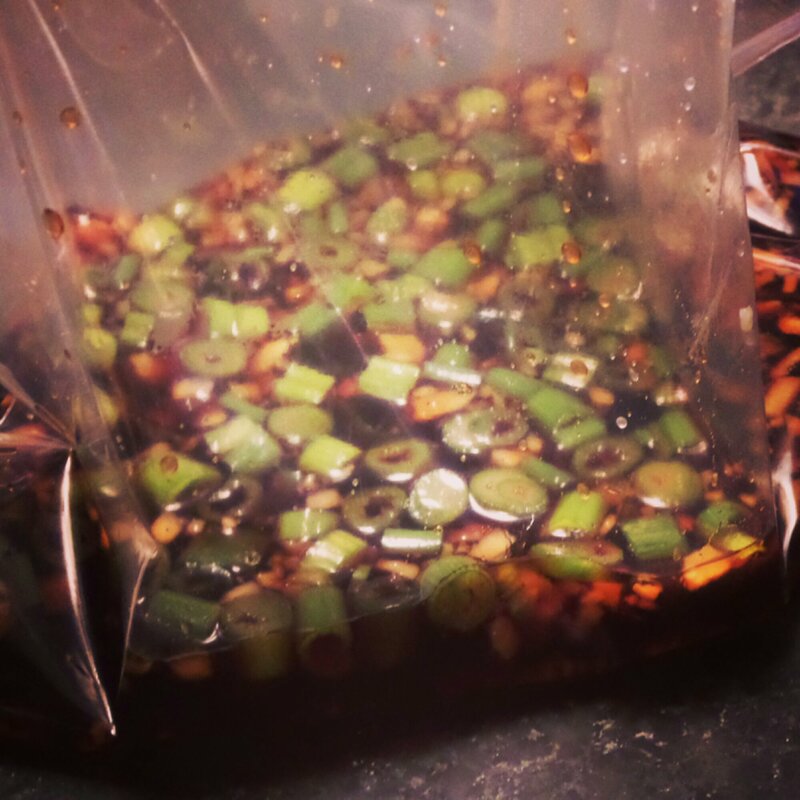 It can marinade for as little as an hour (room temp) or up to 24 hrs in the fridge. Sear it in a skillet on a medium high heat with a little bit of olive oil in the pan. Then, throw it in the oven. The key to browning any meat is not to move it! Let it hang for a couple of minutes on each side. 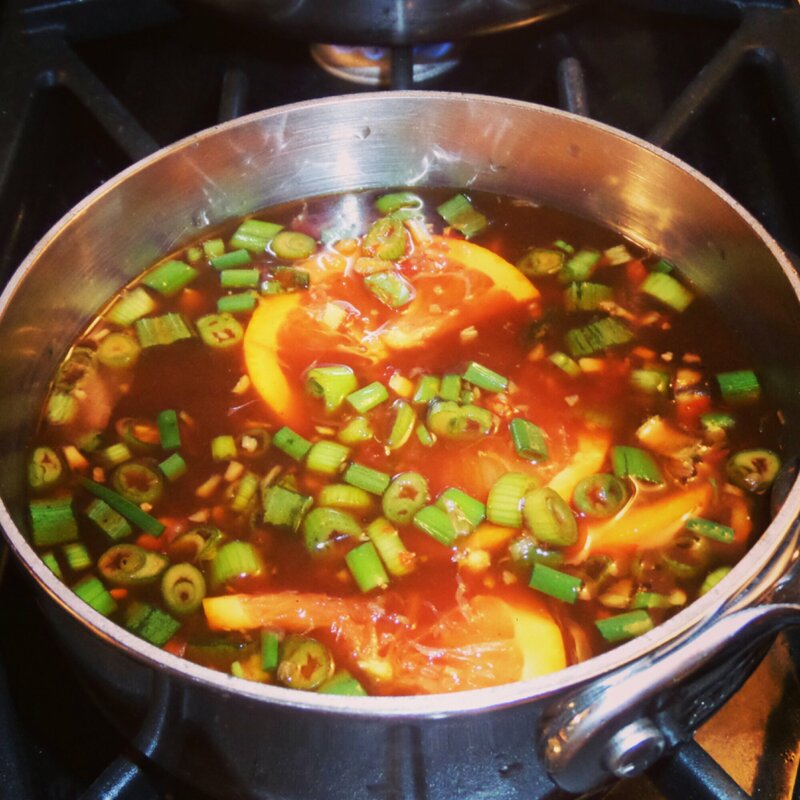 While it’s cooking, boil the leftover marinade for 4-5 minutes. I like to add a 1/4 cup of brown sugar to the marinade as it is potent on its own. Here’s the gig with marinades…. It will never permeate more than 1/8” of the meat so I have a remedy for this. 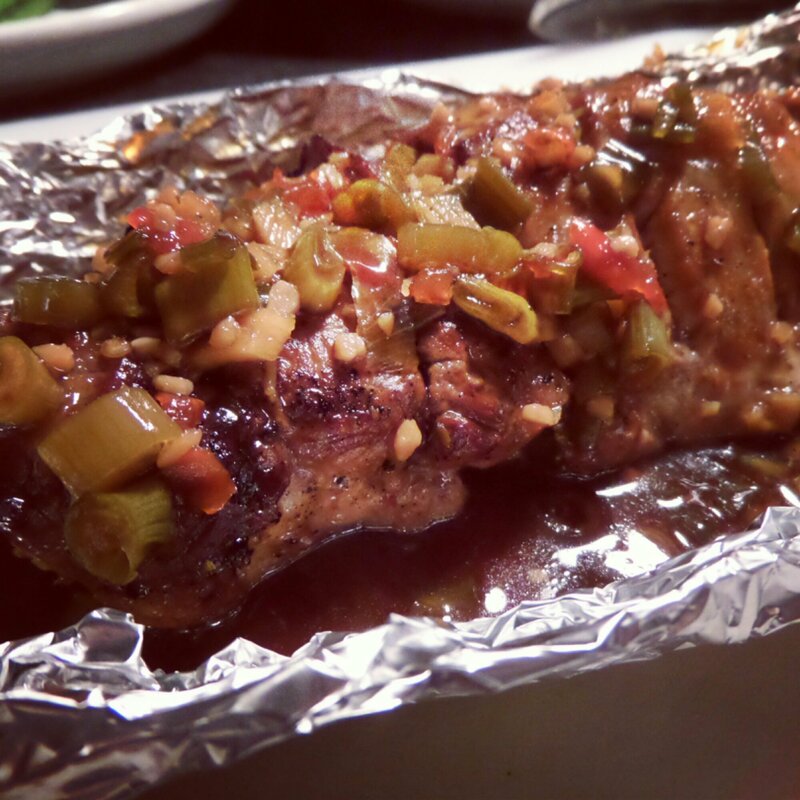 When the pork is done, make a foil boat. Add the pork, pour in some of the leftover marinade and then cover, loosely, with another piece of foil. The ‘boat’ of marinade will allow the meat to absorb more flavor.